BISSELL ProHeat 2X® Premier carpet deep cleaner provides professional style results you can do yourself. This powerful carpet cleaning machine features 10 rows of cleaning with dual Dirtlifter® Powerbrushes, Surround Suction® and a hose and tool to clean stairs and upholstery. Pair the ProHeat 2X® Premier with BISSELL Professional Deep Cleaning formula to get the best clean and protect your carpet from future stains with Scotchgard™ Protector. 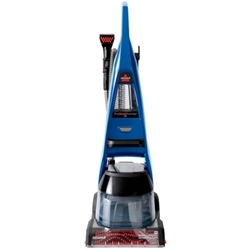 Keep your carpet clean and looking newer longer with the BISSELL ProHeat 2X® Premier. Machine color may vary. These units are refurbished by Bissell and are warranted as such. We cannot control the color of the unit you receive but as Authorized Bissell Dealers we do honor their warranty.